August 28, 1963 Dr. Martin Luther King delivered his famous “I Have a Dream” speech on the mall in Washington, DC. One year later, a half century ago, the Civil Rights Act was signed into law. A half-century is a long time. Yet, as events in Ferguson, Missouri attest to, race remains a problem in America. Change has swept our nation over these years. Technologies abound that no one would have dreamed of. And millions of black Americans have moved into the ranks of the upper middle class, the rich, and the super rich. Yet, despite this, racial ghettos which harbor, even nurture, poverty and crime persist, generation after generation. The tragedy of Michael Brown is too common a story. As the human spirit of black youth is suffocated under these horrible circumstances, frustrations boil over and wind up in violent encounters, often with the police, and a young black man winds up pointlessly dead. 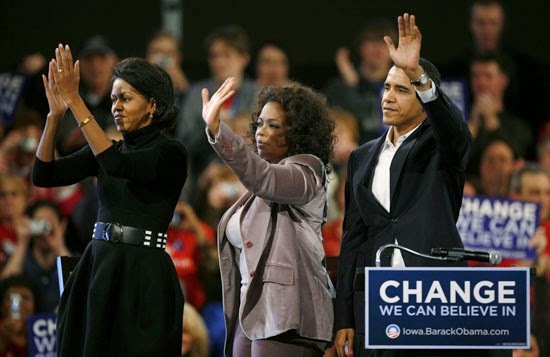 Wealthy black liberals – like billionaire Oprah Winfrey - despite being living proof that the America dream works, who build businesses fueled by American capitalism –invariably join the ongoing chorus of the same, failed explanations of why these impoverished communities persist generations after the Civil Rights Act became law. Liberal black media serves up the same monotone left wing propaganda, the same explanations for failure years after the Civil Rights Act, despite having produced billionaire BET founder Robert Johnson. I broke out of it years ago, after seeing what the debilitating culture of the welfare state was doing to me and those around me. I started my own policy organization in the hope that we could start providing research and information, forums for discussion, to generate light on how misguided government policies keep the poor poor rather than leading them out of the morass. And how these policies undermine the very institutions of tradition – like conjugal marriage and family - that do provide the framework that nourish human growth and potential. The cycle of events is too tragically clear. Tragedies, like what we are now witnessing in Ferguson, bring national attention to the ongoing, self-perpetuating realities of poverty and crime in these ghettos, and the liberals turn the discussion immediately to race rather than policies. They get their 15 minutes of fame and media and then everything goes back to business as usual, with no change, until we repeat with the next incident. When black conservatives, like me, speak out, the attacks, always personal, never about substance, begin. From Bill Cosby to Dr. Ben Carson and now to House Budget Committee chairman Paul Ryan, those who try to shine light, who try to think and analyze and get to bottom of what is wrong and fix it, are attacked. Worse, liberal ideas inevitably are about government money. But the American taxpayer is tapped out. We are running out of money for everything, and certainly for failed ideas. The steps out of poverty are not rocket science. Yet people need to be free to take them. It is insulting that liberals pretend to care about the poor yet fight any acknowledgment of what has failed and block efforts to move forward with what can succeed. Despite mountains of data showing the fruitlessness of secularism and government dependency, the liberal black establishment fights to hold these communities hostage to these destructive forces. Promising ideas abound on how to redirect government policies that can empower rather than debilitate personal freedom and the human spirit. School choice, personal retirement accounts, vouchers to acquire private health insurance and housing. Maybe this time, when the liberal demagogues leave Ferguson to move on to the next “race” crisis, black frustration will lead to a readiness to hear some hard but freeing truths.